Not as good as the first movie, but still somewhat fun and enjoyable for it’s humor as much as for its action. The first time I saw The Expendables, I didn’t really like it. The actors seemed to be playing characters that were merely cardboard cutouts with no real personalities. The story was pretty simple. And the action seemed way over the top. But then I saw the movie again, and I completely got everything that I had missed the first time. The story might have been simple, but it was still fun with it’s general who was caught between his daughter and the real bad guys, Eric Roberts and Stone Cold Steve Austin. the action was also pretty great. Much better than I had remembered. I liked the movie so much the second time I saw it that I was compelled to go see the sequel. Unfortunately, it wasn’t nearly as good as the first film. 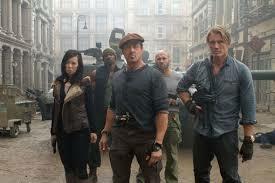 With the first expendables, things had to work in order for there to be more of these movies. 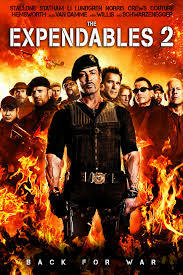 In fact, the expendables not only kick started that series, but also brought both Stallone and Schwarnegger back into the action movie spotlight. Now each of them has a solo action movie coming out, (Stallone’s got bullet to the head, and Arnold’s got The Last Stand), and then they also have another action movie together coming out, called the tomb. And this was all started by the expendables. But unfortunately, the sequel has nothing on the original. It puts in very little effort to tell a story or to set anything up. The characters felt robotic in the first movie, but at least they had storylines. Jason Statham’s character, Christmas, had a side plot about a girl he came home to who was with another man. And that other man beat her. And Christmas saw this and went to find the guy and take on him and a whole bunch of his friends while on the basketball court. That was the first movie. The second one has nothing like that at all. Instead what we get his Chris Hemsworth’s brother, Liam, being a big part of this movie. Liam Hemsworth is the youth of the film. He’s here to get the young audience, who loved him in the hunger games movie, to come and see this. The first movie didn’t care if the younger audience came or not, which is why it didn’t cast any young actors to be a part of the team. hemsworth’s character ends up playing a major role in the first half of the film, being the rookie with a heart of gold. but he doesn’t have much to offer other than innocence and naivety. we hear about his french girlfriend, but we don’t get to see a thing. this is way different than what we got with christmas and the girl in the first movie, where whole scenes were devoted to them. the other thing this movie is deficient in, besides plot, is action. the first movie ended up having a great deal of action scenes. it wasn’t quite as much as i would have hoped for, but it was a lot. and most of them were pretty cool. this sequel doesn’t. there are a couple of them, every now and again, but mostly the movie just tries to get by. it doesn’t have that same energy or that same spirit that the first movie had. the opening action scene ends up being the best one of the movie. it’s also the longest, with characters showing up in a tank and attacking a fortress, rescuing a prisoner, and then going on a lengthy escape. this ends up being the only part of the movie with jet li in it, which is a real shame, since he is the only true martial artist in the cast. li does get to show off a little in his one action scene, but he is gone from the movie way too quickly. and without him, the movie mostly steers away from hand to hand combat. instead, we get lots of guns scenes. sometimes we don’t even see the guns, but just see guys fall down, as in the cast when we meet the lone wolf character, played by chuck norris. and unlike the first movie which featured cool technology and innovative guns (especially in it’s opening sequence), this movie has none of that. everything is just routine. jean claude van damme plays the villain in this movie and he is definitely a welcome addition to the cast. van damme was never a great actor, and he never made a single terrific film. but his better movies were always stupid fun. from timecop to sudden death, he was very entertaining. and listening to him deliver dialogue in english while keeping a straight face was reminiscent of arnold, himself. the expendables 2, as it happens, turns out to be a lot like most van damme movies. it’s not very good, but there’s decent action and humor every once in a while, and it does keep you watching. in fact, the humor is probably the best thing about this movie. the characters constantly break each other balls and insult each other. stallone’s character, barney ross, for example, refuses to let christmas forget that his girl once cheated on him and that he can never fully trust her again. and bruce willis and arnold have some fun little jokes at each other’s careers. one character says to arnold, “you’re terminated.” Arnold says at least twice, “I’ll be back.” and when willis tries to take arnold’s line, arnold responds with “yippie kay yay,” a die hard reference. having only one villain limit the movie in ways that the original film was able to avoid. as much as i think this movie could have been improved, it still wasn’t terrible. these actors all have such a presence that it’s not hard to watch them doing just about anything. stallone handed over the directing reigns to simon west for this movie, and maybe that’s where the problems started. the effort just doesn’t seem to be there. the first movie strived to make the action scenes ones that we had never seen before. this sequel shows no interest in trying to do that. hopefully there is still another film that will be made, and hopefully they get actors like steven seagal, jackie chan, tony jaa, wesley snipes, and maybe even clint eastwood. but no matter who they get, plot will be of utmost importance. this second movie doesn’t live up to the first because it is severely lackinh when it comes to plot. they need to get a solid action director for the third film and i don’t mean the guy who directed con air (simon west, who directed this film), or directed the transformers movies (michael bay). i’m talking about someone like john woo, who knows how to do creative action. that just might be exactly what this series needs.